Cellulite is a kind of fat cells that are free-floating in the human body. Cellulite cells are deposited beneath the skin. The appearance of cellulite is just resembled with the dimpled surface of an orange peel or cottage cheese. The possible causes of cellulite are the hormones, genetics and improper lifestyle. Approximately 85% of women are going through the cellulite problem. The most common organ where cellulite is accumulated is the thighs. Sometimes it may be present on the legs, buttocks or stomach. Now the question arises here that how can you get rid of cellulite problem in thighs? So here you are introducing with some special tips to come out of this situation in a minimum time period. It is necessary to treat cellulite in its early signs because its effect increases with the age and condition becomes worse. Try out these simple and easy home remedies. Dry brushing would be the best idea that should be applied first because it can easily affect the problem and let you sort it out in just a fewer time. Use body brush with natural fibers which helps in reducing the appearance of cellulite because it functions to improve the circulatory system and lymphatic drainage along with the reduction of toxins build up on the upper layer of skin. Make sure that the brush and your skin, both are dry. Start brushing from your feet up to your shoulders with the gentle motion of your hands. Focus the areas where you see more cellulite. Keep the movement of the brush concentrated towards the direction of heart for encouraging the circulation of blood. Keep brushing for about five minutes. At last, take a shower to wash out the dead skin cells. Do this remedy once a time daily. Cayenne pepper is an ingredient which functions to burn fat food. The main property of cayenne pepper is that it can be able to naturally heat up the body, increase blood circulation and boost up the metabolism. It also destroys the dead skin cell and generates the new one that is strong and healthy. Take two tsp of cayenne pepper powder, one tsp of grated ginger and fresh squeezed lemon juice. Mix these ingredients with a glass of warm water. Drink this cellulite detox drink twice daily for two months. You can use coffee grounds as an exfoliating scrub for removing dead cells. Drinking coffee will definitely help in relieving the stress and improve the blood circulation. Take one-fourth cup of coffee grounds, three tbsp. of sugar and two tbsp. of melted coconut oil. Mix these all until it becomes like a smooth paste. Take a little amount of this paste in your palm and massage the affected areas of skin with cellulite for some minutes. Pressure your fingers while massaging. Rinse it with the lukewarm water. Follow this remedy twice a week until you get the better results. Juniper oil is good for reducing the fluid retention so that the cellulite reduction because it contains the detoxifying properties. Take one-fourth cup of olive oil. Mix 15 drops of juniper oil in this. Massage this mixture of oils on the areas of cellulite for 10 minutes. Do this remedy twice daily. After a month, you will feel your skin softer and firmer. Seaweed is also best for this purpose because it is known to be an exfoliating agent; seaweed helps in the stimulation of blood, improves the texture of your skin and excretes out the harmful toxic materials from your body. Hence, it is an excellent agent to reduce the appearance of cellulite. Take three tbsp. of ground seaweed that can be easily available at the health stores. Put it in a bowl and mix one-fourth cup of sea salt and extra-virgin olive oil, few drops of any essential oil for massaging. Apply this mixture in a little amount on the affected areas for 10 minutes before having bath. After bath, apply a good moisturizer. Follow this remedy once a time daily for several weeks. Apple cider vinegar performs the multiple actions due to the presence of minerals, potassium, magnesium and calcium in it. Because of such properties, it helps in getting rid of cellulite. All of these elements play a significant role in flushing out the toxic substances and water retention around the thighs. Mix one part of apple cider vinegar with two parts of water. Add a little amount of honey. 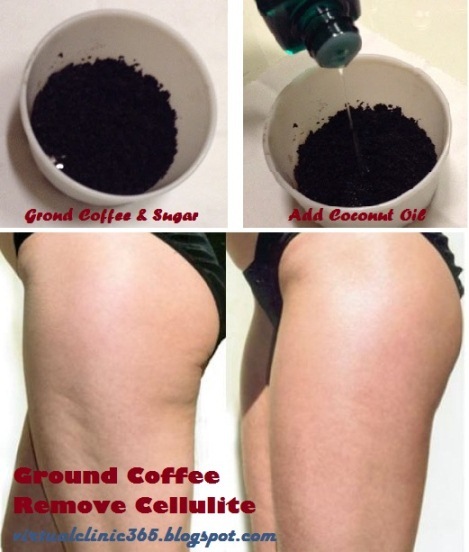 Rub this mixture on the affected areas where the cellulite is appeared. 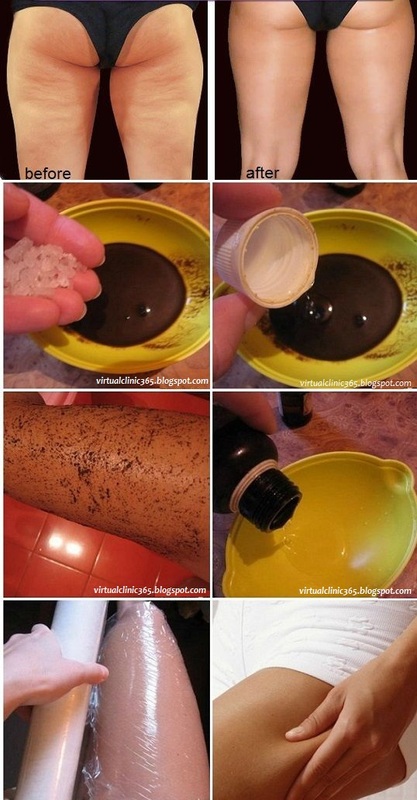 Leave this on the skin for at least 30 minutes then rinse it off with warm water. Follow this useful remedy twice daily until you see the preferred results. Green clay possesses the property of stimulating the blood and lymph circulation and removes the dead skin cells, absorbs the fats and repairs the connective tissues. Due to all these abilities, green clay is good for reducing the appearance of cellulite. Mix one half cup of green clay and seaweed, a quarter cup of lime juice, three tbsp. of hot water, and one tbsp. of organic honey. Now mix them well until it becomes like a smooth paste. Apply this mixture onto the affected surfaces of skin with cellulite using the circular motion of your fingers. Now cover the areas with the plastic wrap. Leave this paste on the skin for 30 minutes. Follow this remedy every week until you see the good results. Salmon has rich contents of antioxidants which help in the breakage of fat cells in cellulite. Omega-3 fatty acids are also present in salmon that are important for the smooth skin and tissue. In addition, Omega- 3 fatty acids also help in reducing the appetite and low-level of inflammation to repair the skin tissues. This also decreases the harmful toxic substances in blood vessels and improves blood circulation. Try to eat four or five serving of salmon each week. Go for the baked or roasted salmon dishes to promote the cellulite reduction. Like the other ingredients, tangerine oil also helps in improving the blood circulation and break down the fat contents of cellulite. This is the essential oil which plays a key role in detoxifying the body. Take one tbsp. of olive oil and add five drops of tangerine oil in it. Apply this mixture on the affected areas and massage for 15 minutes. After using this oil, make sure to avoid sun exposure for at least an hour. Repeat this remedy twice daily for many weeks. Cellulite pockets possess thousands of toxic substances in your body upon the several years. For the natural reduction of cellulite, the first requirement is drinking more and more water to wash out whole the organs as to remove toxins that could be harmful to your body. Water can also keep your body hydrated due to which your skin will glow. You should drink at least 8 glasses of water daily. Drinking water in the morning before eating anything is the best time. If you do not want to drink plain water that you have an option of adding lemon juice or honey. Take the dietary materials that contain higher quantity of water contents such as fruits, melons, cucumbers, orange, and leafy green vegetables. Dear Jessica, "Coffee Grounds" Remedy is tested and effective. Other remedies are also work. I literally just did the coffee scrub like 10 minutes ago and saw a difference instantly. The bonus? My skin was unbelievably soft...the only only thing is that it took a minute to rinse all the coffee off me and my tub...but it was SO worth it, lol. Should it be used coffee grounds? When it says one part this to two parts that...what is it referring to one cup? One tbs ....what??? Mix one part of "Apple Cider Vinegar" with two parts of "water"
its up to you, what you want quantity for apply. if you want two tbsp vinegar then you will need four tbsp water.